Dozing off at work is encouraged at mattress brand Casper's headquarters in New York, where employees can have meetings or take naps on beds provided at the office, designed by local firm Float Studio. 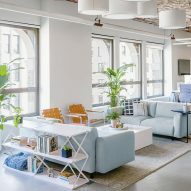 The fast-growing bedding company recently moved to a two-floor office in Manhattan's Flatiron District, designed by Float to reflect the brand's abundant New York subway advertisements. "We drew a lot of inspiration from some of the line drawings used in the subway campaigns," studio partner Nina Etnier told Dezeen. "We liked the tone-on-tone blues used in the illustrations and used that as a direction for the palette and materials." The studio also wanted to incorporate the brand's focus on sleep into the design, so used colours to make the main level resemble the morning and the upper floor suggest night. On entering the offices, a hallway from the elevator leads to the lobby on the lower storey. The glossy purple desk and the blue-stained oak partition behind it are consistent with the pale palette on this level. To the right, the entry opens up onto the common area referred to as the "town hall". Before, small rooms blocked natural light from reaching these two sections, but the designers chose to remove the internal partitions. "The reception and town hall required the most reworking," Etnier said. "We needed to open it up to provide enough space for the entire team to congregate as a whole." The designers saved resources elsewhere by exposing the ceilings and leaving much of the brickwork revealed. 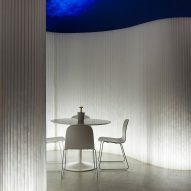 This also brightened the interior and contributed to the morning-like quality of the main floor. 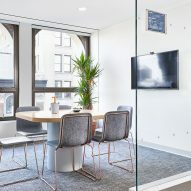 Several other American office interiors feature exposed walls and services, including Paperless Post's New York headquarters and a factory-converted workspace for a North Carolina ad agency. 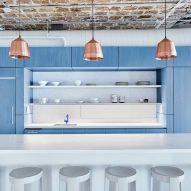 The creation of low-ceilinged volumes within Casper's office also helped open up the space, providing storage spaces and cosy nooks without blocking out all of the natural light. There are three of these rooms dispersed across the office, resembling blue boxes. One is located behind the reception desk, on the east edge of the town hall space, and offers storage. A white-tiled partition stands between its entrance and the communal area. A large rectangle in the middle of the wall allows views between the two, and also provides a space for a projection screen to descend during presentations. Another blue box at the west end of the common room hides kitchen appliances, with shelves to store tableware. The area in front acts as a dining space and a place for watching presentations. "A company's culture that previously felt intimate can spiral out after the company experiences rapid growth," said Etnier. "The town hall is a place to draw the increasingly divergent teams together." Two lounges along the external wall complete the town hall area. 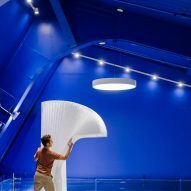 They open out onto the floor without interruption, allowing light from the windows to reach the rest of the office. 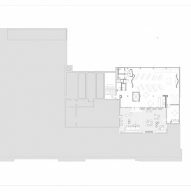 The studio placed the third blue volume within the main open workspace, behind a brick wall to the right of the reception. Inside, three beds offer places for employees to conduct informal meetings or catch up on their sleep. Across the rest of the work area, desks sit in rows among the exposed brick columns. Small offices and conference rooms with glass partitions take up the northeast corner. A staircase to the left of the reception leads up the second floor room, where Float Studio used silver and white patterns against the walls painted in gradations deep blue to evoke nighttime. 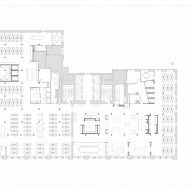 Working with an irregular layout and slanting ceilings, the designers placed curved white fabric partitions to carve out different volumes within the room. The penthouse leads out onto a grass terrace bordered by white stones. Lounge chairs and long tables offer a place to work with a view of midtown Manhattan. 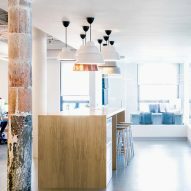 Other nearby workspaces nearby include Slack's Snøhetta designed U.S. headquarters, and Dot's Scandinavian-styled office. Photography is by Aaron Thompson.